Alcorn McBride is unveiling new features to the WinScript Live programming software (pictured above) for its V16Pro, V4Pro and VCore show controllers and introducing 4:2:2 10-bit capability for the A/V Binloop Uncompressed synchronous video player in Booth #669 at IAAPA Attractions Expo 2017. IAAPA Attractions Expo will be held November 13-17 at the Orange County Convention Center in Orlando, Florida. It is the one-stop destination for leisure and attractions industry professionals, including owners, operators, suppliers, investors and developers. Alcorn McBride’s WinScript Live v.4.4 was released this month with a number of new features. 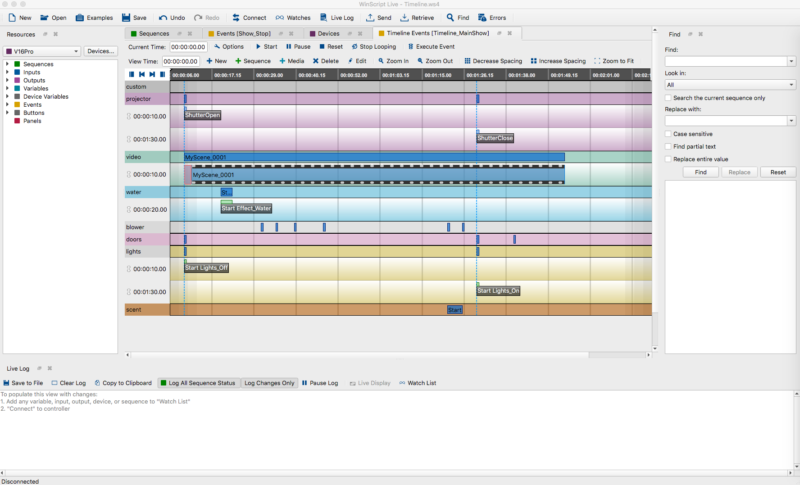 While increased Binloop and RidePlayer support was the primary focus of the release, enhancements also were made to timelines, logging and touch panel windows. Media transfer for RidePlayer and Binloop means users can manage media files directly in WinScript Live. They can view, play and transfer media to RidePlayer and easily drag media onto timelines. In addition, media scrubbing in timelines enables users to jump back and forth to any point in RidePlayer audio and to scrub to any frame when using Binloop video with timelines. WinScript Live is fully supported by the Windows and OSX platforms; the new release adds support for OSX Retina high-resolution displays. New sets of themed graphics are sized specifically for Alcorn McBride’s ShowTouch panels and Apple iPads. SVG Graphics are now supported as well. New slider/progress bars can be created directly in the Touch user interface without creating separate graphics. Volume slider bars used in RidePlayer’s volume page can be copied directly onto the created panel. WinScriptLive offers audio EQ, volume controls and status views for RidePlayer. Alcorn McBride’s A/V Binloop Uncompressed enables content creators to share their work as it was meant to be seen without sacrificing reliability. Now, the synchronous video player adds 4:2:2 10-bit capability to its feature set. The system offers superb playback quality with up to 120fps, 4:4:4 8-bit capability, seamless looping and transitions, and fast seek time. It is scalable with up to 8 channels of 2K60 or 1080p60, up to 2 channels of 4K60 and up to 1 channel of 4K120. The purpose-built device offers consistent, long-life hardware and a rugged, vibration-resistant design. The Alcorn McBride booth will also show RidePlayer for dark rides, coasters and parades. It boasts advanced synchronization, integrated show control, state-of-the-art audio playback and a compact, rugged design. Additionally, Alcorn McBride will feature V-Page, easy-to-use paging and Intercom tools for themed attractions, and V16Pro and ShowTouch for powerful show control with a rock-solid performance.